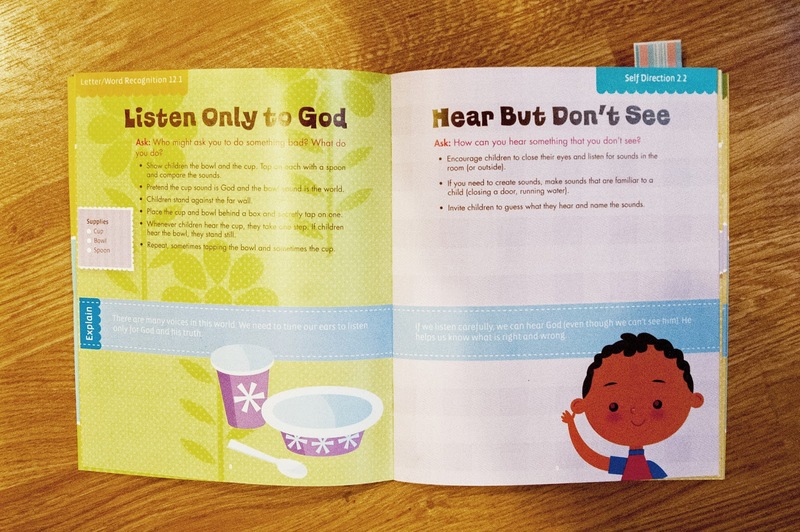 I have been blessed with an opportunity to try out some of Mother Goose Time's other products, including their Experience God curriculum. 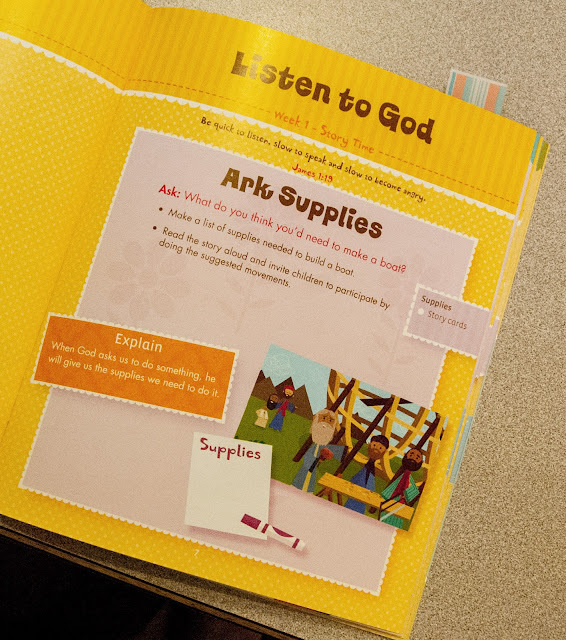 This product can be used at home in correlation with the Mother Goose Time preschool curriculum or it can be used on it's own and for Sunday School at church. Each month has one verse that it really hones in on and then explores it in depth. The month that I am working on is studying James 1:19. Be quick to listen, slow to speak and slow to become angry. What a good lesson for little ones. Each week is then divided up into specific lessons. We just completed week 1's activities and lessons yesterday. 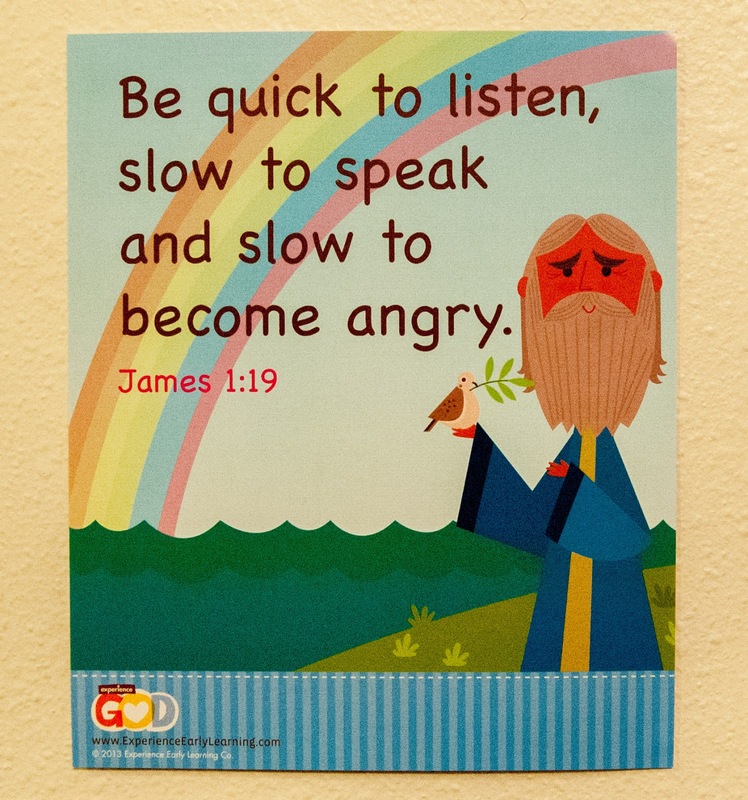 Week 1's lesson was Listen to God. I love how they taught this! The First part of each weeks lesson is to read the story cards. They are beautifully design cards with vibrant pictures on the front for the kids to enjoy as you read the story on the back. The story has cues with in it, on ways to have the children act it out as you read. We are between curriculums at church right now and last weekend was my week to run the toddler nursery. So I brought these story cards with me. I read the story to a whole group of toddlers, so it was fun to test it out on different children. They really enjoyed the story. I tried to add even more of a conversation about the story with these kids because I wasn't sure if they would understand some of the other lessons from the week. So I showed them one half of the 1st story card and asked if the men looked happy or mad? Then I asked them to make a mad face. Next I turned to the half with Noah's family and asked if they were happy or mad? When we got to the 3rd story card, where it depicts the completed Ark with animals boarding, I brought the card up close to a couple kids at a time as I worked around the table. I asked them to point out the animals that were getting on the ark. I also had a few of the older toddlers count how many elephants are in the picture. There are 6 activities each week, the 1st being reading the story cards and then 5 more. So after reading the story card we moved on to Listen Only to God. Each activity is on it's own page. It starts with an open ended question: Who might ask you to do something bad? What do you do? Lachlan didn't quite get the question worded this way. So I tried to come up with another way he might understand. I asked him what he would do if a little boy in class came up and told him to hit that little girl? This sounds awful, doesn't it? I wish I came up with a better question but at the same time I wanted to make it clear to him that what was being asked of him was not the right thing to do. Thank goodness, he did say, he would not do it. To further explore this they had you get out a bowl, cup and a spoon. Tap the bowl with the spoon and next tap the cup so that the children can learn the different sounds. Next have the kids stand on one side of the room. Hide the bowl and cup behind a box or what ever you can find. Tell the kids to pretend that the sound of the cup is God and the sound of the bowl is the world. If they hear the cup or God's voice they are to take one step, if they hear the bowl or the world they stand still. Each page has a blue line running through it with the words Explain and a more synopsis of what we learned from this activity. On this page it says: There are many voices in this world. We need to tune our ears to listen only for God and his truth. The next activity is called Hear But Don't See. The Explain sentence says: If we listen carefully, we can hear God (even though we can't see him). He helps us know what is right and wrong. They had us make a familiar sound to the kids while they have their eyes closed. Then ask them to tell us what that sound was. Next point out that they could hear the sound even though they couldn't see it. I read through this activity and kept it in my head for when an opportunity would present itself. I actually did this lesson in the car. We were all heading somewhere in the car and I told him to close his eyes. Then I spoke and asked whose voice does he hear. Next I nudged my husband, and he spoke asking the same question. I made myself sound shocked and amazed. "You could hear us even though you couldn't see us?" Lachlan chuckled, "yeah." Did you know, even though, we can't see God, we can hear him, if we really listen. I would go over every activity from this week but I feel this blog post might get a little too long. Just trust me that the rest were just as good! The last activity is the craft. Everything you need for the craft comes in the bag, except for the glue, scissors and tape of course. We built an ark, and it is so cute. This it the closet in Lachlan and Peter's room. 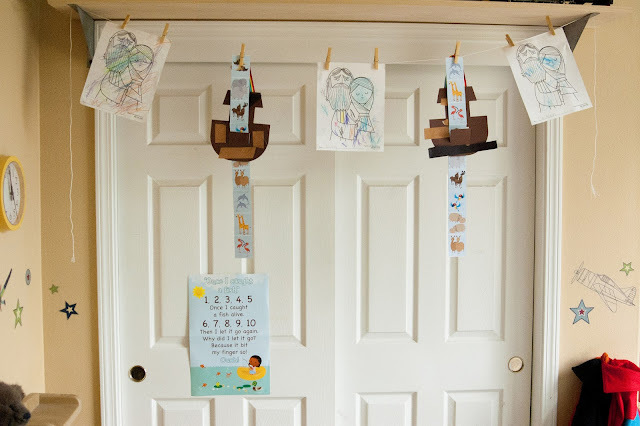 I used the clothes line and clothes pin to hang and display their art. You can see the coloring page and the finished ark. Also, in the bag for each child, every week is a coloring page. On one side of the coloring page is obviously a picture for the kids to color. But what makes this coloring page so genius is that it is two sided! On the other side is another activity. Something for the kids to take home, if it's used in a church setting. Week one has small copies of the pictures from the story cards that can be cut up. 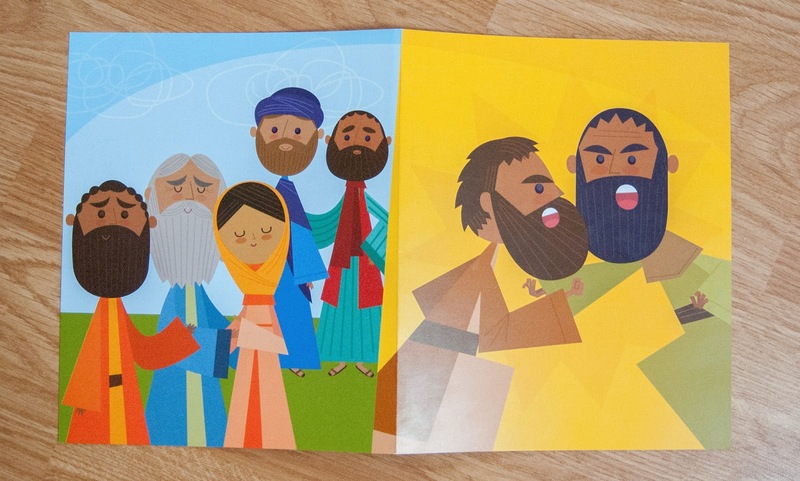 It also has the versus listed for the parents to look up the story of Noah and use the story cards as they read the scripture to their kids. This is just so brilliant to me because seriously, how many coloring sheets from church can you keep? So why not cut it up and use it for a continuing lesson at home? I know that not all parents will use this feature, but it's worth sending it out there, just to try. I often wonder what Lachlan learned about in Sunday School. Sometimes it will come up in the next couple of days as we are talking and he brings up something I know I didn't teach him. The alternative is that I ask him what he learned in Sunday School. His answer "Jesus." It's always Jesus. Smart kid.